Building Information Modeling (BIM), a 3D virtual modeling software, has long helped architects, engineers and construction teams visualize building projects to identify potential design, construction or operational issues. Now, BIM is moving into facilities management on college campuses to increase productivity and lower risks. In 2014, Franklin W. Olin College of Engineering sought to better leverage data analytics of its facilities management operation. The goal was to use technology to collect, integrate, maintain and use visual modeling to improve planning, space utilization, energy optimization and delivery of daily operating services. In particular, the facilities management department needed a technology to accurately collect, validate and host space and equipment data, as well as the ability to store essential documents to operate, manage risk and support strategic planning. The ability to integrate this data with other facilities software systems, such as their Computerized Maintenance Management System (CMMS), was paramount. Olin’s efforts were based on three desired outcomes. First, to improve customer service by reducing historically inefficient, time-consuming efforts to respond to service requests. Second, capture and maintain service and facilities information to enable data-based and informed decisions. Third, to operate within budget limitations by reducing the risk of excessive energy consumption, space density challenges, and outstanding emergency and corrective work orders. Having the right data all in one location would provide advanced insight into the entire campus operation and improve risk minimization efforts. This technically innovative approach aligned well with Olin College’s mission to graduate engineering innovators. Prior to BIM, Olin maintained building and systems data in multiple locations and in multiple formats, such as spreadsheets, blueprints, hard copy manuals and software programs. It had no way to bring all of the data together or the ability to access and analyze it in real time. Olin College solved this challenge by implementing a Building Information Modeling (BIM) system, using smart cloud technology and integrating data with its existing Computerized Maintenance Management System (CMMS). The combined capabilities allow the facilities team to collect, model, validate, access and report performance data in real time. The College has vastly improved its decision-making, operational efficiency, cost management and risk exposure. Improvements have been realized in building system operation, cleaning services, energy consumption, strategic planning, and budget management. For example, at many colleges, a heat or cold call begins a lengthy and time consuming process of correction. With limited information shared by the requestor, a technician must first physically locate the problem or equipment source, often in areas difficult to access. Once identified, a replacement part may need to be sourced, either in inventory or to be ordered. This process is time consuming, disruptive to the learning program, and many times incurs excessive energy consumption. At Olin College, facility staff have immediate access to floor plans, resource documents and operational manuals using handheld devices and computers. They have the ability to virtually open building floor plans and identify equipment serving the area where the customer has issues. By clicking on the floor plan and the equipment in that space, one can quickly access the operational resource documents, view notes on the last time the equipment was maintained and assess consumable supplies needed. This preparation by the technician has proven to reduce corrective action time by an average of approximately 20%. Furthermore, the technology reduces risk in the event of a campus emergency. For example, during a flood from a broken pipe, staff can remotely identify and shut off the water source, prevent costly damage and expensive insurance claims, and potentially prevent increases in insurance premiums. The visual feature of the system allows Olin to improve planning, space utilization, schedule staffing, budgeting for cycle maintenance and create “what if” scenarios on proposed building modifications. An additional benefit is that the College has integrated BIM into its academic curriculum by allowing engineering students to participate in the use and analysis of the technology and process. The benefits of BIM in campus facilities management mirror those in the construction industry. Within the software, 3D models visualize building structures and systems so operators can view their geometry, spatial relationships, geographic information and property information. The software allows operators to analyze building elements, cost estimates, material inventories, project schedules and more over the entire building lifecycle. Accurately measured maintainable space is difficult and time-consuming to collect. Facilities managers often rely on contractors to provide cost estimates for flooring replacements (i.e., carpets, vinyl, etc.) or painting based on their measurements. Having the BIM database quantities of flooring by type and walls by color allows a manager to more accurately plan and create maintenance budgets. Accurate data reduces assumptions in the contracting process and results in more accurate costing. While architects and builders have led the growth of BIM technology, facilities management departments are beginning to see its potential. The United Kingdom has taken the lead in adopting BIM technology into facilities management. Its rapid adoption is being driven by a central government mandate requiring use of BIM on all national public projects by 2016. Furthermore, a recent SmartMarketReport by McGraw Hill Construction found that nearly 55 percent of U.K. building owners have already leveraged BIM for building operations and facility management through the building lifecycle. Meanwhile, in the United States, only 14 percent of building owners have adopted the technology. Further, by 2019, almost 92 percent of U.K. owners expect to be using BIM for building operations. This is a sharp contrast to the United States with just 49 percent expecting to be at that level. While BIM adoption in facilities management is experiencing a slow start in the United States, experts predict that it will pick up in the next few years for many reasons, including these five advantages. Streamlined Maintenance. 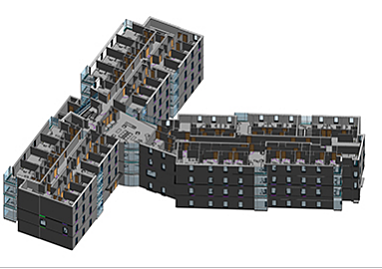 Integrated building models in BIM applications provide immediate access to valuable documentation from one single interface—including pre-mapped campus viewpoints, operations and maintenance documents, building drawings and systems schematics. In this integrated environment, maintenance teams can instantly access critical building information on a hand-held device. Additionally, mechanical and operation equipment can also send alerts to facilities management when, for example, maintenance is required. Improved Space Management. With access to complete building information, including the details of how building space is being used, institutions can better manage their campuses’ space and secure improved building maintenance and reduced renovation expenses. For example, colleges and universities need unified facilities data across many different departments on campus. Yet the naming and coding of the space is often drastically different. Such systems as the Computerized Maintenance Management System, Space & Event Planning, Door Lock Control Access, Building Automation Systems, and Fire Control systems operate on accurate floor plans and space identification data. Rooms named differently in the fire control system than in the as-built drawings creates risk for an institution. Likewise, discrepancies in event planning software and building automation systems software can lead to event disruptions and longer temperature control and service response times. The use of BIM and industry standard coding systems allows institutions to better manage and coordinate campus space. Efficient Energy Use. BIM models can be used as a comprehensive portal to obtain information and statistics from each piece of building equipment on a campus, including, mechanical systems pressures, power consumption, utilization of electrical and IT equipment, and room temperatures. Streamlining the maintenance process allows equipment to be properly maintained to the optimal environmental conditions while avoiding waste associated with inefficient operation. Economical Retrofits and Renovations. Along with maintenance and repairs, better information about buildings and their condition helps institutions strategically plan remodels. The complexity of renovation and retrofit projects can be simplified, avoiding potential cost overruns associated with incomplete information. Enhanced Lifecycle Management. BIM strengthens the strategic planning process. Some building design professionals are embedding data on life expectancy and replacement costs in BIM models. In this way, they are helping owners better understand the benefits of investing in materials and systems that may initially cost more, but have a better payback over the life of the building. BIM also offers the ability to track depreciation of assets to fully recognize financial and tax benefits. There is no denying that access to better and more comprehensive data in real time across today’s campuses will change how facilities are managed on campus. With deep reservoirs of spatial data, BIM’s potential to change facilities management as we know it is unlimited. As more campus administrators understand the cost and risk management benefits of BIM technology and its data-based decision-making properties, adoption will change from a nice-to-have capability to a strategic imperative. When used appropriately, the data can improve performance and save time, effort and money in running and maintaining buildings and systems throughout their entire lifecycle. Access to data that is accurate and complete allows institutions to become better stewards of their physical and financial resources. Read more about the Future of Facilities Management and how technology advancements are affecting higher education's ability to manage facilities successfully, while still achieving its broader educational objectives. As the Senior Director for Facilities Innovation, Matthew Judge pilots and implements cutting-edge technologies for facility services programs. Mr. Judge has oversight of a diverse development team that continuously researches the market, partners with manufacturers, aligns with Aramark facilities subject matter experts and listens to customers and operation teams to develop unique innovative solutions.